The PRR was introduced to Sri Lankan copyright law with the expectation of addressing the needs of the vocalists in the music industry. Nearly fifteen years since the introduction of the national PRR under the Intellectual Property Act of 2003, this chapter focuses on what the vocalists express or consider to be the issues they battle with in the practice of music—covering and secure position—in order to better understand their concerns and, in addition, to introduce the discussion in the following chapter on the adequacy of the national PRR to address such concerns. This chapter is based on the findings of the empirical study carried out in Sri Lanka. The chapter also makes comparisons with the UK, USA and Indian situations to highlight the distinctive position in Sri Lanka. 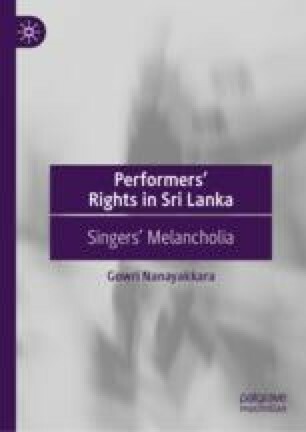 An earlier version of this chapter was published as G Nanayakkara, ‘Mimesis, Cover Versions and the Commercial Vocalists’ Dilemma; Sri Lankan Perspective’ (2012) 1 International Conference on Asian Studies: Official Conference Proceedings 461–474. Ajwani, D, ‘Unequal Music: Singers Demand Royalty but May Have to Take a Cut in Upfront Payment for Each Song’ (Forbes India, 4 November 2009) http://business.in.com/article/resolution/unequal-music/6242/1#ixzz1ZuGz1g2R. ‘Good Copy Bad Copy’ https://www.youtube.com/watch?v=ByY6j0qzOyM. Kolada, B, ‘New US Bill Aims to Improve How Musicians Get Paid on Digital Platforms’ https://www.residentadvisor.net/news.aspx?id=41631. Kondwani, ‘Full Circle: The Beatles & Hip Hop’ (It’s a Black-White Thang) http://www.kurrentmusic.com/blogviewer.html?blog-guid=9d2eab7e-99a4-4e2f-9767-387285c85d88. Mosser, Kurt, ‘“Cover Songs”: Ambiguity, Multivalence, Polysemy’ http://www.popular-musicology-online.com/issues/02/mosser.html. Rimmer, M, ‘The Grey Album: The Copyright Law and Digital Sampling’ http://works.bepress.com/matthew_rimmer/16. Sorcinelli, G, ‘How the Grey Album Reinvented the Re-mix’ https://medium.com/micro-chop/how-the-grey-album-re-invented-the-remix-740e7c9f2631. Subramaniam, K, ‘Singers from South to Claim Their Due’ (The Hindu, Chennai, 20 August 2013) http://www.thehindu.com/todays-paper/tp-national/singers-from-south-to-claim-their-due/article5040406.ece. Tiwari, S V, ‘Finally After 5 Years, Indian Singers Claim First Royalty Amount’ https://www.mid-day.com/articles/finally-after-5-years-indian-singers-claim-first-royalty-amount/19317189. Turner, D, ‘The Cover Song Quagmire’ (Music Dish, 11 June 2004) http://musicdish.com/mag/?id=9460. ‘US Bill on Radio Music Royalty Gets Key Backing’ (Intellectual Property Watch, 29 April 2010) http://www.ip-watch.org/weblog/2010/04/29/us-bill-on-radio-music-royalties-gets-key-backing/.